Sew It Together Sponsor – Innergreen! I am delighted to announce that Innergreen is a new sponsor of SIT Sydney 2011! Have you heard about Innergreen? This is amazing stuff! Literally! Innergreen produces a range of Eco-Friendly products that are derived from 100% natural resources. In fact, the products that will be of most interest to you are made from 100% natural corn. Yes, corn!! Products like bags, cushion inserts, toy filling and wadding….all made from corn! Innergreen is the only product on the market that is made from 100% renewable resources. There are loads of benefits to using Innergreen’s products if you care about the environment, and you care about your family…. Innergreen fibres are slower to ignite than many natural and synthetic fibres, and it has also been found that the smoke is much less toxic than other synthetic polyesters. The production of Innergreen fibres produces substantially less CO2 emissions than that produced by petroleum based plastics. Innergreen fibres are more resilient than many oil-based polyesters….resulting in a more plump, buoyant and longer lasting fibre. I must admit, I hadn’t really thought much about the products that I use in my cushions, toys and quilts. I had no idea that so much of the world’s oil resources were being used to produce materials in everyday products such as clothing, carpets and soft furnishings. Innergreen offers an alternative that will not only reduce our dependance on oil, but also reduces waste. If you’d like more information on Innergreen’s products, you can find it on their website here. I guess you’d love to know what the clever crew at Innergreen have for us at Sew It Together? Everyone will receive an Innergreen Corn Bag, made from 100% corn, as your Sew It Together goody bag, and I’m hoping to fill these with lots of goodies for you! A huge thank you to Tristan and the team at Innergreen for their support of Sew It Together, and their generous offer of so many prizes and bags for everyone. I’m really looking forward to seeing the products; and you’ll all be able to see them and have a poke and a prod at the Saturday Crafting Session. I’m definitely excited about the opportunity to be more responsible in my choice of crafting materials. Just a quick reminder that the last day for early-bird registrations (save $10!) will be 30 November. Pay your deposit here, if you haven’t already! (After 30 Nov, the deposit will rise to $60, so everyone will pay the exact same final payment). And I apologise for my absence over here. My trip to Japan took up a lot of time pre-departure, and then I was actually away, and now life seems to be heading at full speed into Christmas, but I have a 2 year old’s birthday before that…….and I have so much to tell you about Sew It Together next year. More blog posts to come as soon as I can get them out….. This week I did a reconnaissance trip to The Remnant Warehouse in Sydney, to see if it qualified as a fabulous-enough fabric shop for our Friday Fabric Shopping trip, and I am pleased to report that it did! The Remnant Warehouse is a large (pink!) shop with plenty of patchwork and dress fabrics, notions and supplies. I found some fabric that I had been looking for (on the sale rack too!) and also some lovely Japanese fabric that I hadn’t seen before. I really think there is something for everyone here and it will be a great stop on our bus trip. While I was there, I spoke to the ‘man in charge’, Joe, about our visit next year, and he very kindly gave me 3 gift vouchers on the spot for our Friday shoppers! So, when you sign up for the Friday Fabric Shopping trip (details still to come) remember that we’re off to The Remnant Warehouse, and there will be 3 vouchers up for grabs on the bus before you get there! Thanks very much, Joe, and everyone at The Remnant Warehouse! See you in March! The Menzies Hotel have offered reduced rates for accommodation for Sew It Together 2011 participants. For the Friday night, the current public rate is $259.00; you can pay $224.00. For the Saturday night, the current public rate is $389.00; you can pay $299.00. These rates are available until 25 February 2011. After that you can just book the best rate of the day. The hotel has limited (10) twin rooms available at this time (ie 2 x single beds, or 2 x double beds). If you are interested in sharing a room with someone and want one of these, I strongly suggest that you book sooner rather than later! To book, call The Menzies Hotel on (02) 9299-1000 and quote code 110325SEW. This code will only be valid for direct calls to the hotel. I’m in the process of putting together some information about alternative places to stay if you find this is out of your budget. Stay tuned! 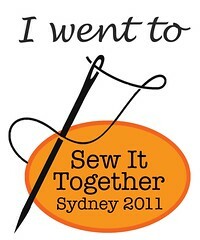 I’m delighted to tell you that we already have some sponsors for Sew It Together Sydney 2011! Retromummy – despite barely arriving home from hospital with baby #4, Corrie was the first to jump in (again!) with an offer to sponsor Sew It Together next year. You’ll all receive a little bit of delicious Retromummy fabric in your goody bags! Vintage Ric-Rac – the genius behind such legendary favourites as Ernst (who nearly caused a papparazzi stampede at SIT 2010), Small-Bot and Cat-Bot, and newer heroes, Fiskar, Olfa and Guterman; Jodie has again offered to sponsor Sew It Together, and throw some free stuff our way! Posie Patchwork – another busy mother of 4, Jennie, who started Posie Patchwork 11 years ago, creates all manner of gorgeous goodies and sells beautiful fabrics in her online store, at Shop Handmade in Canberra, and at lots of other markets around ACT and NSW. Jennie will be popping a little bit of Posie magic into your goody bags! Ladies, thank you so much. You are each a perfect example of the kind, generous bloggers that I have come to know and treasure in this community. I am sure everyone appreciates your generosity; given so warmly and without hesitation. Thank you! Would you like a new button for your blog? If so, you can email me at chaletgirl13@gmail.com or sheridan@sewittogether.com.au and I will forward you the code. (If there are any WordPress wizards that know how to put this on the blog for everyone to grab, please let me know. I once spent 3 days trying to figure out and gave up. I don’t often give up, you know). Thanks again to Donna for our fabulous logo! 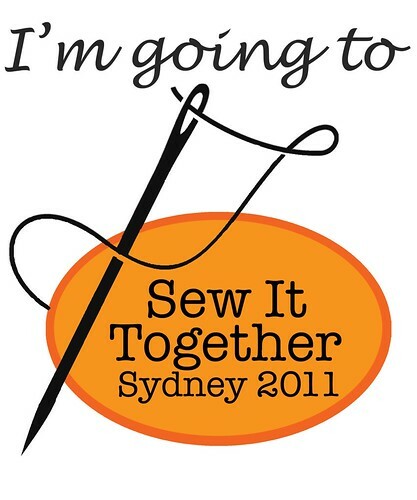 I’m delighted to announce that bookings are now open for Sew It Together Sydney 2011! The Saturday Crafting Session is the main event of the weekend, and you must buy a ‘ticket’ to this to attend any of the other events*. The cost is $125 per person for the Crafting Session, but if you pay your deposit before 30 November, 2010, you will receive an early bird discount of $10 per person which brings it down to $115 per person. Deposit is $50 per person. There are 4 other ‘smaller’ events that I’ll have further details for soon. They start from lunchtime on Friday and finish at lunchtime on Sunday. 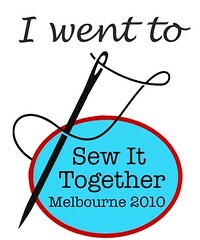 Once you pay your deposit, you will have a confirmed place at Sew It Together 2011. I can only refund your deposit if I can fill your spot. (For the record, this year I was able to refund the full payment to everybody who cancelled, so please understand that I am careful with your money. I will always do my best to find a replacement for your place, but obviously I cannot guarantee it). Remember, this event is open only to genuine bloggers who like to sew, knit, quilt or crochet, etc. Please make sure that you include your blog address in the Message To Seller field. I reserve the right to return the deposit to you (at your cost) if you buy a ticket and are not a genuine craft blogger. And here are the details that you have been waiting for! The Saturday Crafting Session will be held at the Menzies Hotel, Carrington Street, Sydney. We have a lovely room reserved for us, with large windows, lots of light and plenty of room for us. The location is fantastic – directly above one of Sydney’s main city train stations (Wynyard), and close to the main city bus routes along George St and York St. Tessuti (Sydney City) is just around the corner, and Morris & Sons is just a little further up York St. It’s also just a 10 minute walk to the wondrous world of Kinokuniya, Sydney. Included in the cost is morning tea, lunch, afternoon tea, and your SIT attendance package which includes your goody bag, lanyard and information booklet. The Session runs from 9:00am to 4:30pm on Saturday 26th March, 2011 and the cost is $125 ($115 for early birds) per person for the day. *This is so that my fixed costs (mostly insurance) are covered. I am sorry that I cannot be flexible with this – no exceptions will be made! 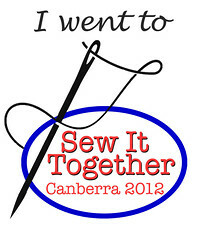 PS If you are interested in being a sponsor of Sew It Together Sydney 2011, please contact me at chaletgirl13@gmail.com! I wish I could give you all the details for next year’s Sew It Together, but I am still working on them. You should know that the tentative date is 25-27 March 2011. It will be in Sydney. If you click through to the blog now, you can see the new Sydney 2011 logo! If you’d like a button like the one on the right for your own blog, please email me at chaletgirl13@gmail.com for the button code. A huge thank you to Donna for creating next year’s logos. I love the colours, they remind me of a sunny Sydney summer! Are you prepared to pay up to $20 extra per person for a central/CBD location? How important is it for there to be accommodation attached to the venue? I’d love a venue with natural light. Is that important to you? How important? Any venue will have to be accessible by public transport, so take that as a given. I know everyone will have differing opinions, and I know I can’t please everybody, but again, this event is for YOU, so please share your thoughts. Thanks! to attend, you must blog. your blog can be all about craft or occasionally crafty, but there must be some sort of craft featured on your blog. and it will cost more (I did not cover my costs with this one, and the next one has to, or I may be divorced. I’m okay with it, so please don’t worry, but you should know that it won’t be as cheap next year. And you should know that that is the reason, not because I have suddenly decided to make my fortune from you folk). Any updates, as they happen, will be announced here.